Based on Deleuze’s words: ”The map is open and connectable in all of its dimensions; it is detachable, reversible, susceptible to constant modification”, the Konfluentîa II project by Claudia Robles Angel produces imaginary cartographies from the experimentation and analysis of satellite pictures of the cities of Bogotá and Cologne. The new maps achieved by Claudia Robles discover spaces of convergence implicit in the vigilance and observation of a modern world permanently monitored and digitalized. These new maps – inspired in the book Invisible Cities by Italo Calvino – present not only the confluence between the two cities, but also the transformation into imaginary cartographies obtained from structures found in nature, such as spider webs, trees, lines of the hand, honeycombs, etc. 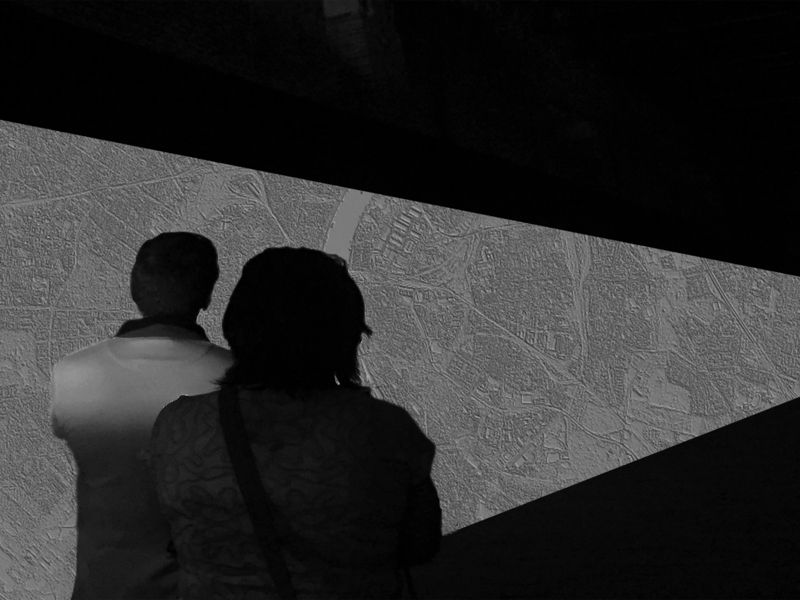 The spatial experience proposed in Konfluentia II incorporates also soundscapes especially made to converge with the “map-scapes”. In Konfluentia II the audience is invited to perceive both cities through an aerial route but very close to the floor, which offers the possibility to get lost in a new imagined city, resulted from the confluence between two very concrete metropolis. The soundscape invites to wander on the ground through a sonorous portrait of each one of the two cities. At the end of this excursion, the audience find themselves within a unique new city, an amalgamation of both cities, a new metropolis seeking to melt in a new incarnation. Deluze G, Guattari F, Massumi B. A thousand plateaus: capitalism and schizophrenia Continuum. International Publishing Group, NYC, p. 13. «…. and in his dreams now cities light as kites appear, pierced cities like laces, cities transparent as mosquito netting, cities like leaves’ veins, cities lined like a hand’s palm, filigree cities to be seen through their opaque and fictitious thickness » Calvino I. , Invisible Cities. Harcourt Brace Jovanovich, 1974 p.129-130.